AS THE 2020 Democratic primary heats up, a brace of left-wingers are fighting over who can be more radical. 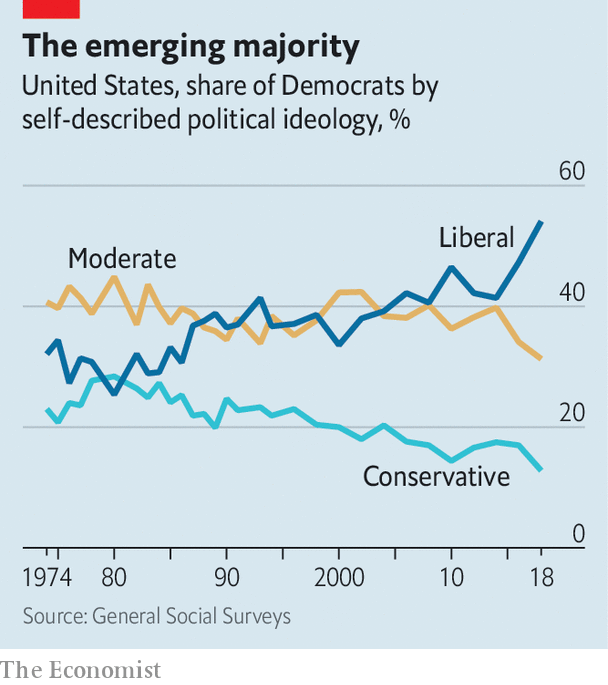 They will take heart from the fact that for the first time, more Americans who affiliate with the Democratic Party call themselves liberals rather than moderates or conservatives. According to the newest figures from the General Social Survey (GSS), a long-running poll from the University of Chicago, 54% of Democrats describe themselves with the L word. In 1974, when the GSS first asked the question, only 32% did. What exactly the word “liberal” means in America is contested. But it does seem that Democrats are indeed moving to the left. The Co-operative Congressional Election Study (CCES), a poll led by researchers at Harvard University, also released new survey data this year. The numbers show that even Democrats who describe themselves as conservative tend to support left-wing policies. Over nine-tenths support Medicare for All (a form of universal health care). About the same proportion want the federal minimum wage to increase to $12 per hour (it is currently $7.25), and the Environmental Protection Agency to regulate CO2 emissions. 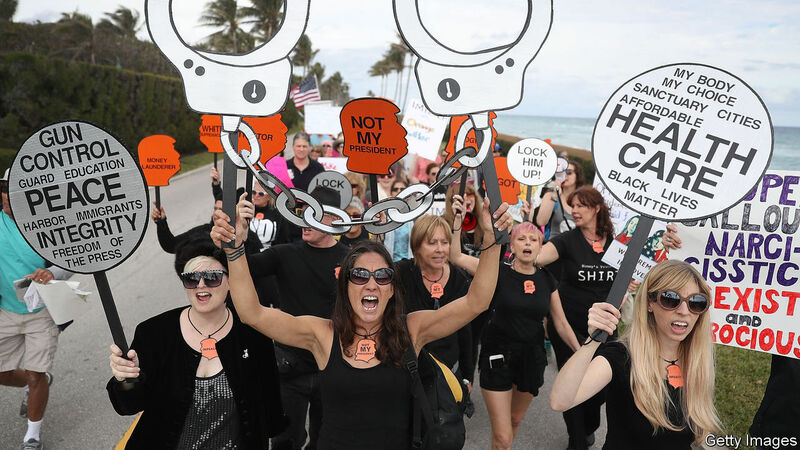 Four-fifths say that women’s access to abortion should be unrestricted. There are limits to the leftward swing. According to the CCES, less than a quarter of Democrats believe that they are “very liberal,” the left-most position on the scale. Some popular positions among high-profile Democrats are not yet mainstream among the rank and file. For example, the idea of paying reparations for the costs of slavery, endorsed by Alexandria Ocasio-Cortez, a firebrand member of the House, is not universally accepted. Only 51% think that black Americans should get special treatment to help them catch up. In the end, it is not enough to win over registered voters. Though Democrats outnumber Republicans, Republicans tend to turn out. Democrats have to win over more independents too.